Monte Vista Festival of the Crane 2013 /Hawks Aloft Inc.
First of all, I’d like to apologize for the lack of posts the past three months! Our website was attacked by malware and it took a Herculean effort to rid the pest from our website. Don’t worry, you were not in danger of contagion! Thanks to Michele Hymel, Eugene Rooney, Rick Valles, and the services of Sucuri Monitoring Systems for all their work. All of our sites are now monitoring regularly and offensive material removed immediately. One of our most favored events is the Festival of the Cranes in Monte Vista, Colorado in the heart of the San Luis Valley. The National Wildlife Refuge and surrounding open fields provide critical stopover habitat for cranes on their spring and fall migrations. And, each year on the second weekend in March, we bring a cadre of our educational ambassadors to display at the sumptuous space that they provide for us. 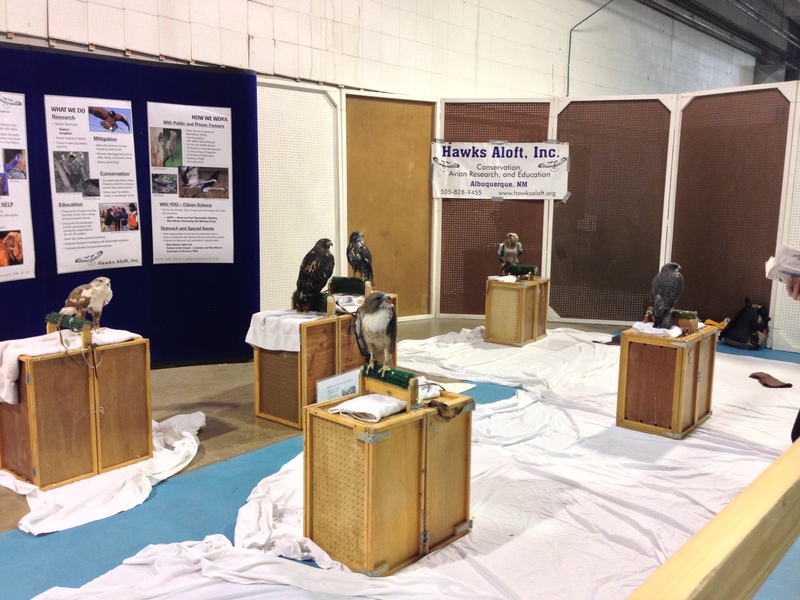 It is only here, where we are the only bird group, that we have the luxury of displaying 10 or more birds at one time. Big birds all lined up! Ferruginous Hawk, ruphous morph Red-tailed Hawk, Harlan’s Red-tailed Hawk, and Rough-legged Hawk. The other wonderful thing about all this space is that even our more nervous birds sit calmly atop their display boxes because there is adequate distance between them and the viewers. Most of them are happy to perch all day long in this indoor environment. 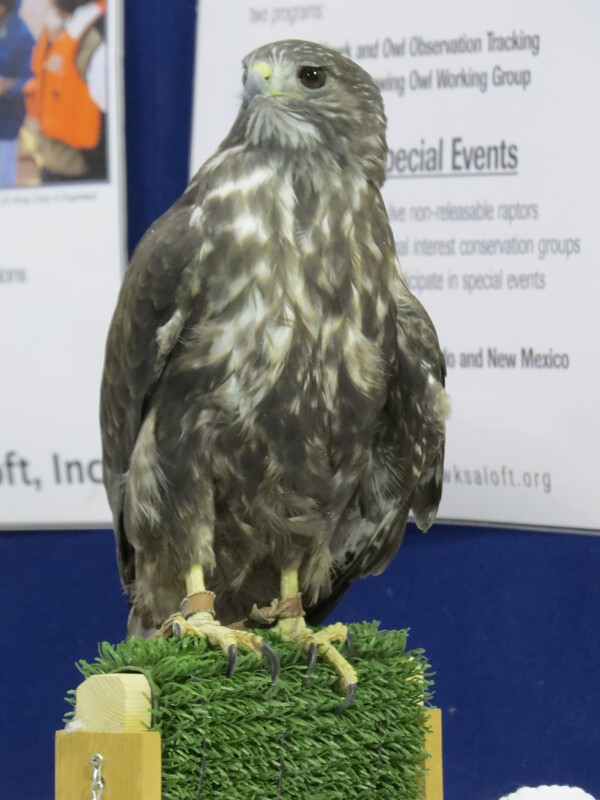 Harlan, our Harlan’s Red-tailed Hawk made his debut at this event in 2013. Image by Mike Quaintance. 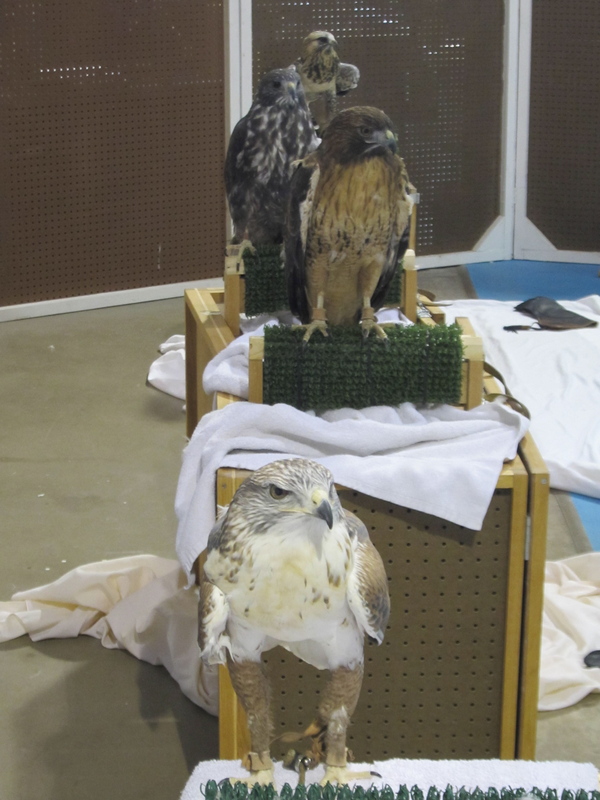 During the summer of 2012, we were thrilled to receive a non-releasable Harlan’s Red-tailed Hawk from the Cascades Raptor Center in Eugene, OR. Already an adult when he was injured, this event is perfect for the nervous fellow. Harlan’s Hawks are mostly found nesting in the far north and are generally only found this far south during the winter months. 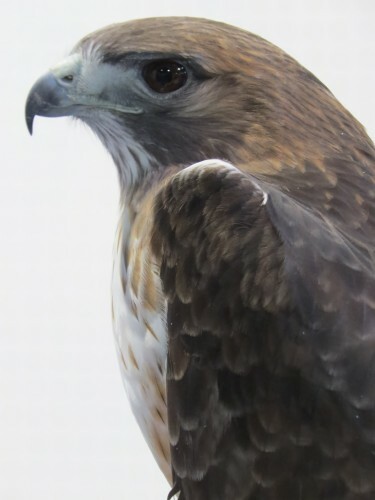 They are classified as a subspecies of Red-tailed Hawk although there is controversy over this matter and some people believe they should be elevated to a full and separate species. Quemado, our light-morph Red-tailed Hawk, was injured when he contacted live electric lines as a juvenile. He is one of only a handful of birds to survive this type of injury. Image by Mike Quaintance. Perhaps it was the electrical current that coursed through his body, resulting in the loss of his left wingtip and a toe on his right foot, that makes Quemado (which means burned in Spanish) so nervous. This beautiful male Red-tailed Hawk WILL NOT sit on a gloved hand for any reason. However, in this arena and many others, he sits contentedly all day long. Ferrug, our 16 year old male Ferruginous Hawk, is another one of our nervous Nellie types. Image by Mike Quaintance. He was found on Rowe Mesa, near Santa Fe New Mexico, alongside a dirt road. He had suffered a broken wing that was not repairable. We have never solved the mystery of how it came to be that our Ferrug was struck by one vehicle on a small, two-track rural road where it’s not easy to travel more than 25 MPH and then rescued by another. He’s not talking either! 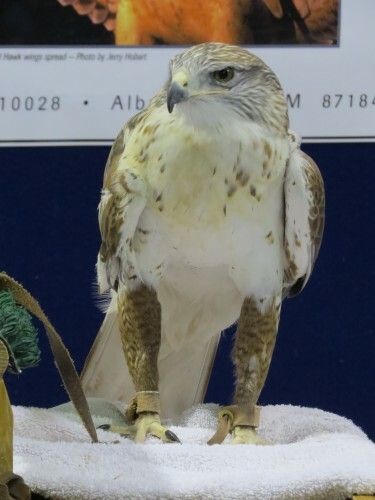 A valued member of our education team, he is the only educational Ferruginous Hawk in New Mexico that we know of. The Hawks Aloft Team (l-r): Gena Esposito, Education and Outreach Coordinator, Chuck Brandt, co-founder and volunteer, Chellye Porter, volunteer, Lizzie Roberts, educator, Maurice Mackey, volunteer, and Erin Greenlee, Ornithologist. 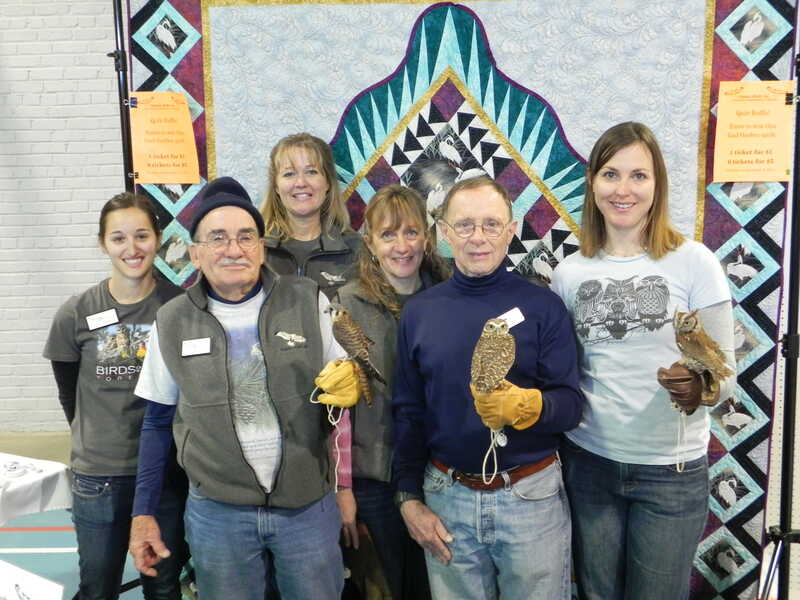 Here are the human members of our 2013 Monte Vista Crane Festival Team and some of our smaller educational ambassadors (l-r), female American Kestrel, Burrowing Owl and Eastern Screech-Owl. Not shown are Ty Sutherland and Mariah Oeser, who drove up early Saturday morning in a snowstorm and then drove back home on snow and icy roads on Sunday morning. We couldn’t do it without you guys!